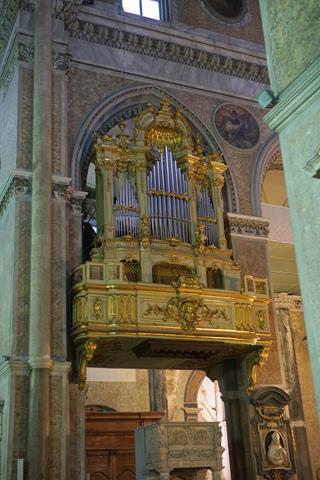 To round up this series on Naples and the surrounding area, I present to you: the churches that we saw (faith), what we ate (food) and, perhaps most importantly, a question: should you visit Naples? (Further thoughts.) I apologise if the alliteration is too much for you! 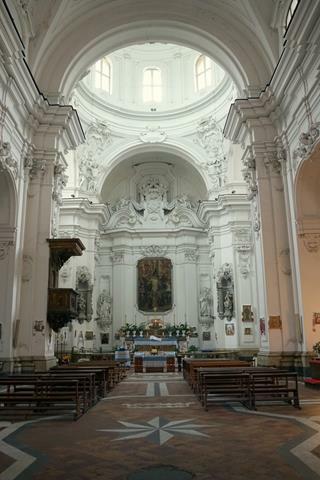 Like in most European cities, there are plenty of grand churches in Naples, especially in the historical district. However, what we really wanted to see was the grand Duomo. It took a while to find (probably due to a combination of poor map-reading skills, inadequate street signage and traipsing around in the rain without any rain gear whatsoever). From the outside it looks completely unremarkable and we actually walked right past it, but the interior (14th-century French Gothic style) is a different story. 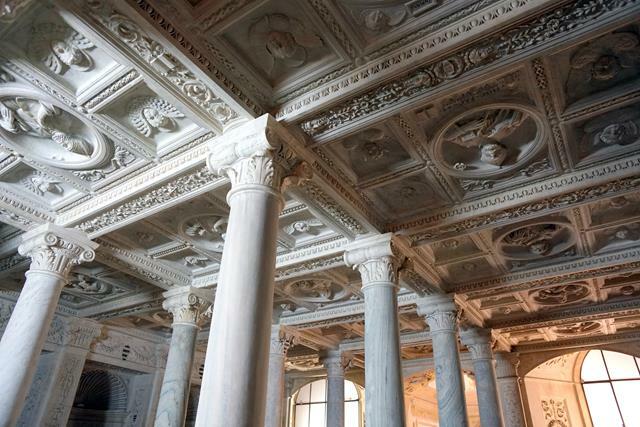 The ornate and intricate decor demands your attention. 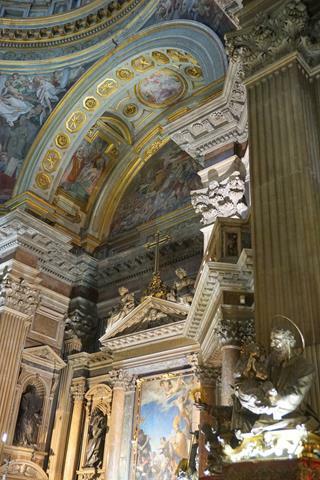 At the front of the cathedral, just before the main altar, steps descend to the Cripta Gennaro. 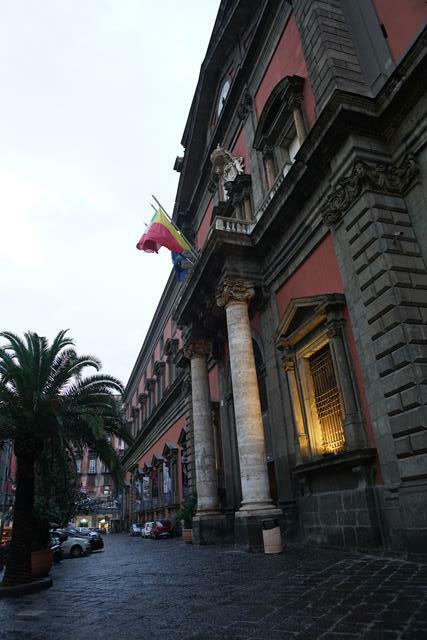 San Gennaro (Saint Januarius) is the patron saint of Naples. 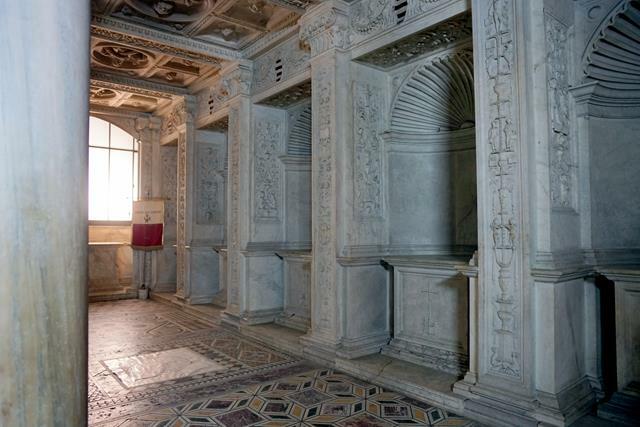 The crypt altar apparently contains vials of his blood, which is said to liquefy several times a year on specific dates, although it can also liquefy on other days. 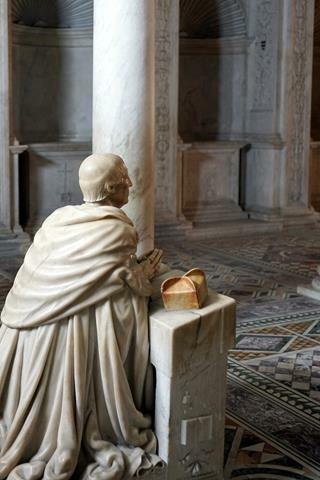 The most important date is 19 September, the saint’s feast day. If it fails to liquefy, it is believed that is an omen of a disaster about to befall the city (e.g. a plague in 1527 and an earthquake in 1980). 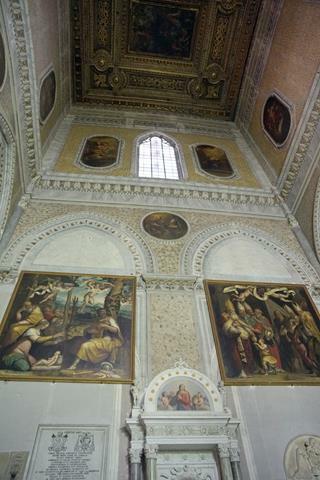 As you can see, access to the altar was restricted so we could only take pictures from afar. 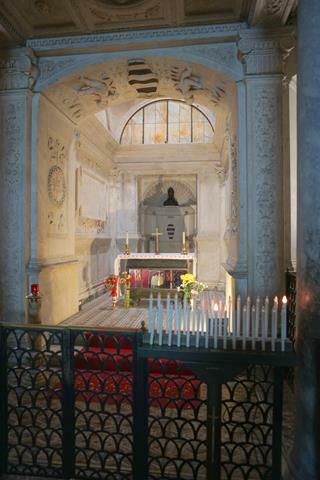 You can see a bust of San Gennaro’s head behind the altar. This is probably the highlight of visits to the cathedral (assuming you’re not there for the blood liquefaction). On the left side of the nave is the Basilica di Santa Restituta, underneath which are excavations. You can tour the excavations at certain times, but parts of it (including a Greco-Roman mosaic floor) are visible from the chapel thanks to glass panels on the floor. 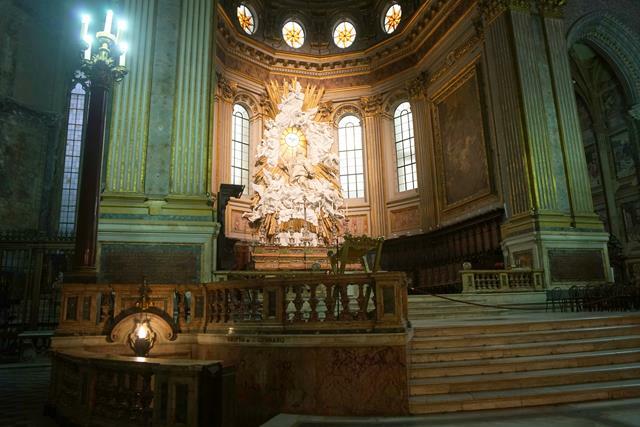 Opening hours: Cathedral – Mon-Sat 8am-12:30pm and 4:30-7pm; Sun & holidays 8:30am-1pm and 5-7pm. Excavations – Mon-Fri 9am-noon and 4:30-7pm; Sat-Sun and holidays 9am-12:30pm. 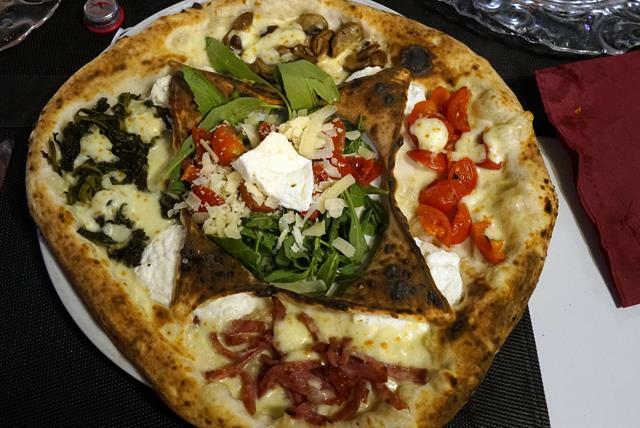 We only had about two days in Naples, but we liked the following eateries so much that we visited multiple times. 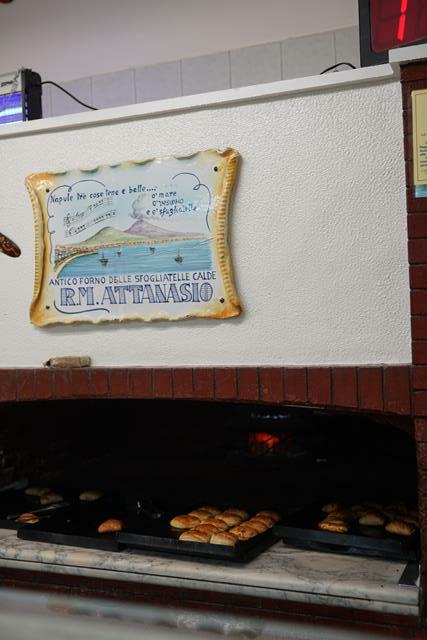 Here three things are beautiful – the sea, Vesuvius and sfogliatella. 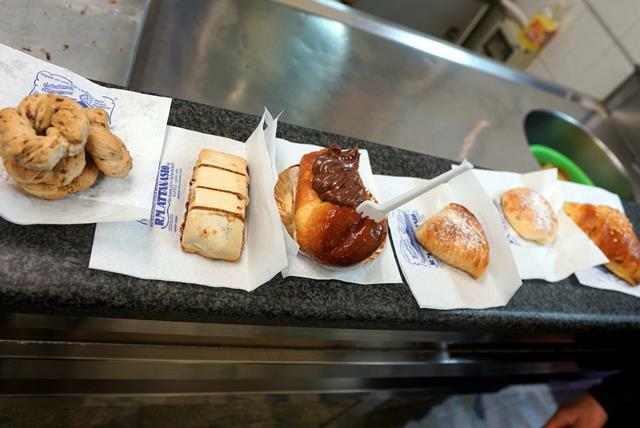 Sfogliatella is a shell-shaped filled pastry and it’s obviously one of their specialties, but they have such a huge variety of pastries and sweets that we were spoilt for choice. I wish I knew the name of each, but we just randomly picked whatever looked nice, and some were suggested by the staff. Most of them contained some alcohol (which isn’t necessarily what you want for breakfast) but they were still delicious. I also bought a slab of white chocolate nougat (torrone) for the flight back. This was recommended by our very kind AirBnB host. It was just a few blocks down from the apartment, and we went there for dinner two days in a row. The food was both affordable and good, although the pizzas took a while to come. But that’s what appetisers are for! I suppose it’s a testament to how freshly made they are. 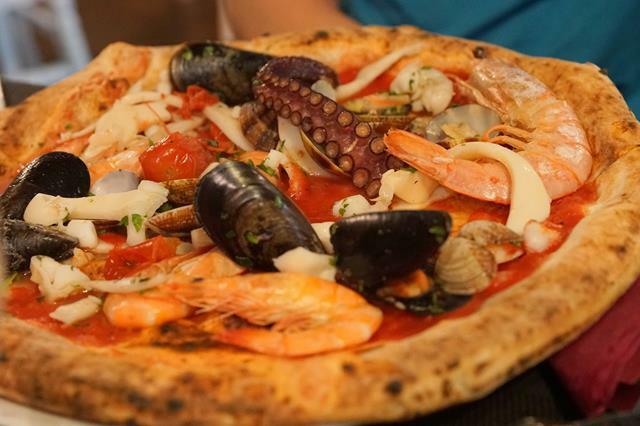 Pizza pescatore, with a massive octopus tentacle. Pizza stella (star) – no prizes for guessing why. Other things we tried include the carpaccio, bruschetta, carbonara, pizza piccante, tiramisu and panna cotta. One meal cost us less than EUR15 each. So, should you go to Naples? In 2015, Italy was the 5th most visited country in the world, behind only China, Spain, the US, and France. But according to the New York Times, only 13% of those tourists venture to southern Italy. Many of you seem to be among that 13% – I’ve been encouraged by the number of people who’ve commented here about their own trip to Naples. However, the reasons for giving it a miss are many. You can read about some in detail here, but personally I think it boils down to poor marketing and safety concerns. #1 – Poor marketing: I lived in London as a university exchange student, and took advantage of the cheap and plentiful budget flights (thank you, EasyJet and Ryanair) to explore nearby countries. Not once did visiting Naples ever occur to me. I was vaguely conscious of it as a place of great historical significance, but I would’ve been hard pressed to tell you exactly what there is to do or see there. 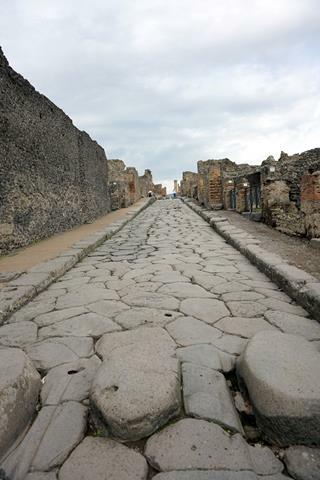 I didn’t even know that it was near Pompeii and Mount Vesuvius! (In my defence, in the Singapore school system we don’t focus much on Italian geography or history. I can tell you about (some) Chinese dynasties though.) I kept hearing about Rome, Venice, Milan. Southern Italy? I only knew of Sicily and the mafia. But is it in fact dangerous? Bear in mind that I am by nature a somewhat paranoid traveller, and close friends have been pickpocketed (or almost pickpocketed) in various Western European cities. My paranoia was alleviated slightly by the fact that we were a group of 4. “It’s kind of grubby,” someone warned. I have to say that’s true. The streets are generally narrow, grimy and not terribly well-lit at night. It’s one of the poorest cities in Europe and the youth unemployment rate is over 50%. However, at no point did I feel particularly unsafe or afraid (except when crossing the road – nerves of steel required!). We walked around at night, after dinner, and the streets were quiet but it felt fine. So, before you write off any destination based on what you may have heard about it, I encourage you to do some research for yourself. Don’t be afraid to question conventional wisdom. Don’t just take it from me – for insight from the perspective of a solo female traveller in Naples, check out this great post by Indiana Jo. Have you ever gone somewhere considered ‘unsafe’ and found it not to be true? Wow, that’s brave of you! I remember the concern bird flu caused. Turkish people are extremely friendly, I hear! I’m headed to Naples on Monday. This was super helpful–thanks! “Is Naples a city?” Oh man, that was so hilarious, thank you for showing that Google search! 😀 We had a cruise port day at Naples and couldn’t quite get past all the seedy port areas. We would like to give it another try, though, and the pizza we had there was incredible!! Google auto-complete can be really good for a laugh sometimes! I’ve heard that Naples is the birthplace of pizza so it’s only right that the pizza there is incredible 🙂 Thanks for stopping by, Christy! I’ve only been in Naples for a day and found the city OK, as far as safety concerns. However, there are definitely neighborhoods where you wouldn’t want to wander around at any time. 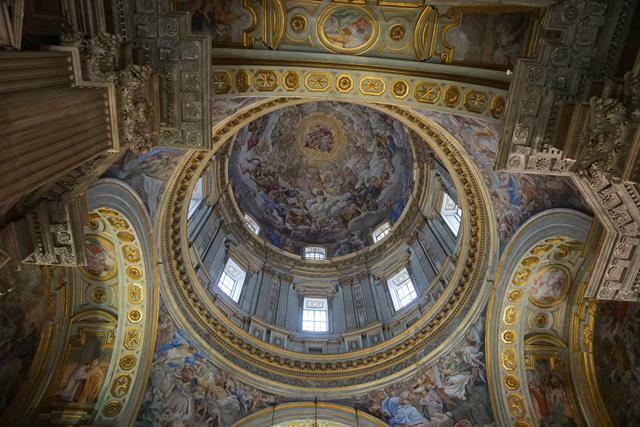 The Naples cathedral was quite stunning, as your pictures also reflect it. 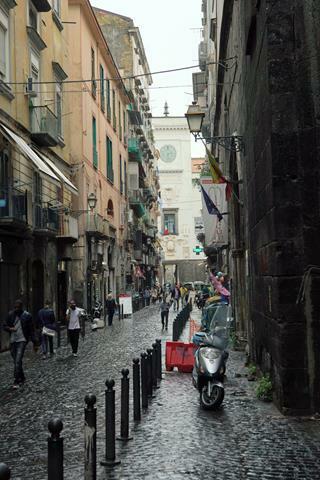 I visited alone over ten years ago and just loved Naples. 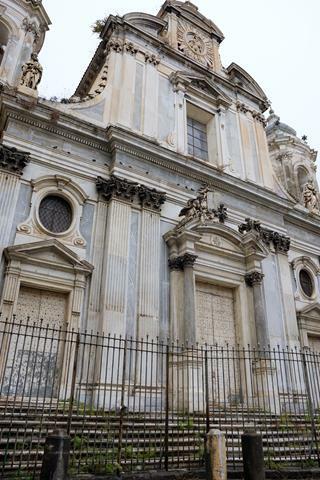 I loved the architecture of the churches, eating seafood beside the harbour and eating Margherita pizza in the restaurant where it was first invented. Also loved the street where they make all the nativity scenes. Did you go there? I don’t remember feeling unsafe but you do always have to be careful particularly when you’re travelling alone. Really enjoyed reading your account and love your photos of the cathedral and that amazing looking star pizza! I don’t think so, what street is that? That sounds really interesting. I only spent a few days in Naples so we didn’t really venture beyond the historic quarter and even then, we had very specific destinations in mind. Totally agree that you always have to be careful, especially when by yourself! Thanks for stopping by and commenting, Clare! I love Naples, but it does definitely have some seedy parts. But there’s so much to do in the city and the surrounding area that I can easily see past those blemishes. Great article, Michelle. I completely agree with you! It’s not perfect by any means but its flaws doesn’t mean you should not visit altogether. Thanks for stopping by and commenting, Jim! 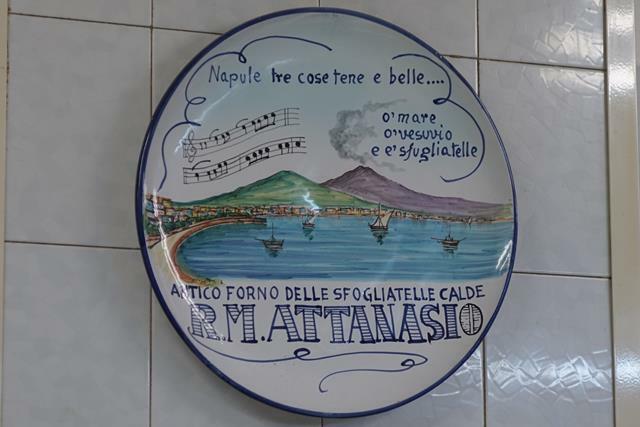 As you mentioned, Naples is a city that grows on you with it’s faith and food. I loved the post and can’t wait to follow you on more travels. the second pizza looks delicious.